Handbell Musicians of America Area 9 is excited to announce that we will be offering a scholarship to National Seminar 2017! Check our website often, watch social media, and look for updates right here in our newsletter for complete details and the deadline. Learn about more scholarship opportunities from Area 9 on our website. Resource Library offers an exciting collection of articles, interactive PDFs, PowerPoint webinars, videos, and more to help you expand your knowledge as a handbell musician. All Handbell Musicians of America resources are available exclusively to our members. 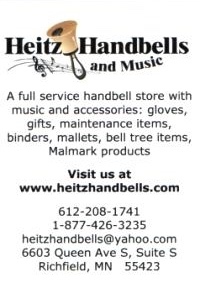 Non-members, you can join Handbell Musicians of America at join.handbellmusicians.org to get access right away!